In this thread you'll find a brief overview of all five clans, including their rank issues, details on the policies and length of leadership for the current leaders, and any key reminders on the way each clan works that can be often forgotten. • formed between falconstar and pinestar to take down the badgers threatening both territories. • formed between magpiestar and rosestar, the two leaders are on very positive terms, and it isn't unusual for them to meet to discuss various political and domestic issues. • formed between rosestar and redstar in order to combat the hint of a rogue threat including the remnants of leaftalon's gang. • caused due to deep dislike between falconstar and rosestar. could quickly grow in severity, due to rosestar holding the saving of two thunderclan kits over falconstar's head. • the recent border scuffle has left the clans with a sour taste toward each other. no doubt this is prone to get worse. • falconstar and magpiestar are on decent terms with each other, however sunningrocks will always be an issue, as will stronger alliances standing between riverclan and shadowclan. • welcome terms established for gatherings, but no inter-clan relationship exists. SHADOWCLAN (11 moons ago) - (details) Leaftalon, the demoted ShadowClan deputy who left the clan and his gang of rogues returned to attack. Leaftalon gathered them from across the territory, ex-clan cats and born loners and rogues alike. The goal being to remove Rosefur from the position and get revenge for her taking it from him, maybe taking Loudstar with them. Cats die in the crossfire, with Loudstar losing a life, however Rosefur also takes Leaftalon herself. SKYCLAN (8 moons ago) - Teaselstar passed away in his sleep, the cause being simply old age. Pinestar becomes leader and chooses Half-face for his deputy. RIVERCLAN (7 moons ago) - Snailstep retired to the elder's den after having served Magpie as deputy for 17 moons. Yewtail was named as deputy in his place. SHADOWCLAN (6 moons ago) - Loudstar passed on to StarClan, leaving Rosestar as leader. She names Neritefang as her deputy. SHADOWCLAN (6 moons ago) - Littleheart dies mysteriously in his sleep. Sparrowpelt becomes the full medicine cat. RIVERCLAN (6 moons ago) - Nettleheart takes on Blackpaw as the medicine cat apprentice. SHADOWCLAN (5 moons ago) - ShadowClan is struck by illness from a diseased piece of prey from carionplace. It takes one of Rosestar's lives, and along the lives of many others. RIVERCLAN (5 moons ago) - Magpiestar lost a life due to illness shortly after the death of Willowbreeze, his mate. He likely caught the disease from her. Quick action by Nettleheart saved the leader from further loss and earned much praise. THUNDERCLAN / SKYCLAN (5 moons ago) - (details) A badger's nest was found in ThunderClan territory, unfortunately found by an unexpecting Applestar, who lost three of her four remaining lives escaping the badger's grasp. Falconfeather quickly organised a patrol to face them, and requested a meeting with SkyClan's leader. ThunderClan's patrol included Falconfeather, Birchsong, Blizzardclaw, Hazelclaw, Bearclaw, and one other cat. SkyClan's patrol included Pinestar, Snowfall, Lilyfang, Elksong, Foamsong, and Sootcloud. Together, the two clans found the badger and it's offspring and quickly eliminated them as threats, all cats returning with injuries, but no more lives were lost. ALL CLANS (5 - 2 moons ago) - Lack of prey over leaf-fall and leafbare led to weakened immune systems and a higher than usual death toll among weaker members of the clan. There was a death toll in all clans, with WindClan fairing the worst, and SkyClan the best. SKYCLAN (4 moons ago) - Pinestar loses his first life from a falling branch, and is dragged free from it by another warrior, preventing further loss. WINDCLAN (4 moons ago) - Ashtooth was killed. Swiftfoot was named deputy in their place. SHADOWCLAN (3 moons ago) - Sparrowpelt takes Crowpaw on as the medicine cat apprentice. SKYCLAN (3 moons ago) - Juniperjaw steps down from the medicine cat position, leaving Tawnygaze as the full medicine cat. WINDCLAN (2 moon ago) - Beetleberry chooses Flurrypaw as the medicine cat apprentice. THUNDERCLAN, (2 moons ago) - Applestar never survived the badger attack, and died of what the clan believed to be her injuries, however the truth being she took her own life with deathberries. Falconstar becomes leader and chooses Hazelclaw for his deputy. SKYCLAN (2 moons ago) - Tawnygaze takes on Tigerpaw as the medicine cat apprentice. RIVERCLAN (2 moon ago) - (thread) Yewtail stepped down as deputy after 5 moons in the position, her resentment for Magpiestar something she refused to give up on, and to avoid it interfering with the clan any longer, she stepped down. SHADOWCLAN (1 moon ago) - (thread) Neritefang steps down from the deputy position. Onyxfeather is named ShadowClan deputy. ALL CLANS (1 moon ago) - (thread) The gathering has taken place, all clans on good terms and communication and friendly behaviour shown across the board. However, there is a small clash between Redstar and Rosestar, over rogues on the borders. THUNDERCLAN (1 moon ago) - Sandfeather retires from the medicine cat position to the nursery as a permanent queen, due to her hind leg injuring causing her more trouble. Stormbird was due to become full medicine cat, but wished to retire as well. With no other options, Blueberry stepped up to fill the position once more, and Peachpaw became medicine cat apprentice. SHADOWCLAN (1 moon ago) - (one/two) An ex-kittypet, Twotone, is found on ShadowClan territory, and wishes to join the clan. In an event that had a lot of the clan unsettled, Rosestar agreed to give him several moons to prove he belonged with them, renaming the cat Greypaw. SKYCLAN (1 moon ago) - (thread) Pinestar held a ceremony to name Dovekit, Silentkit, Campionkit and Vervainkit apprentices. However, he also posed the question of territory expansion. The general word was strong, they should make moves toward the river. RIVERCLAN (1 moon ago) - (thread) Bearkit and Maplekit become apprentices. RIVERCLAN (1 moon ago) - Whitewater steps down as deputy, wishing for more experience before taking the rank. Ashenfang is named deputy in his steed. SKYCLAN (1 moon ago) - (thread) Half-face stepped down from the deputy position, and Pepperstrike named in his place. ALL CLANS - A non-played gathering took place, where all clans remained on good terms. SKYCLAN / RIVERCLAN - (thread) SkyClan's patrol decide to investigate the river, and play with fire by crossing the river. Of course, RiverClan find them, and a fight almost breaks out, before being interrupted by Pinestar. RIVERCLAN - (thread) Ashenfang stepped down from the deputy position, and Duckstep was named in his place. However, surprise shook the clan, when immediately after the decision was announced, the leader retired from his position, making Duckstep now RiverClan's leader. RIVERCLAN - (thread) Duckstar receives her nine lives, after Magpiethorn resigned his remaining ones. Now, all that lies ahead is the announcement of the clan deputy. SKYCLAN - (thread) Furious, and accepting the resignation of Pepperstrike, Pinestar returns to camp with the soaked border patrol, and arranges a meeting to announce the new deputy and address over-confidence in the wake of territory expansion. » RiverClan's camp is positioned on an island. So leaving the camp does involve a brief swim to get to any other part of the territory. » Duckstar, in the position for less than 1 moon. 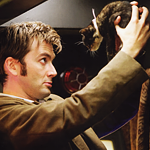 » Duckstar is—and always has been—an optimistic (if not stubborn) cat. She’s the sort that would far rather be friendly than show claws… but don’t mistake her for one that wouldn’t tear the whiskers off a cat that crossed her! While she’s almost always quick to lean toward sparks of friendliness and portrays a jovial and relatively relaxed social attitude, she’s also known for being extremely protective. Her bias leans extremely heavily toward her Clan, and while she might be hurt or angered by jabs made toward herself it’s the Clan that stands at the forefront of importance in Duckstar’s mind. Threats will be dealt with swiftly, though Duckstar is one of the more open-minded of leaders because she believes that—ultimately—every cat deserves a chance to prove themselves. Whether as a potential ally or something more. Rogues and Loners are treated warily. Duckstar is friendly but outsiders are still outsiders—if they’re interest in her Clan it’ll be more than just getting by her radar. Being a young leader, Duckstar wants to keep the senior warriors in the loop as much as possible. This means that, though as leader she gets final say, she will definitely take the consideration of cats older than her very seriously and that may alter the way she treats certain infractions. As for the breaking of the warrior code to take a mate in another Clan, this can get a little different of a reaction. Love is extremely important to Duckstar, and she believes strongly that sometimes cats just find it in different places—but that doesn’t mean she actually approves of it. The she-cat would likely allow a cat from another Clan to join hers if only because that means, hey, someone’s lost a warrior and she’s gained one. This doesn’t mean she wouldn’t be a little wary, and she would do her best to be certain of their loyalty as they grew attached to her Clan. Even so, it’s likely that Duckstar would do her best to try and make them feel welcome. After all, home is where the heart is. Duckstar’s political ties are still brand new and haven’t really been touched on yet. She’s wary of SkyClan at the moment, because she knew of their border infractions when she was still a warrior and has made a note to keep an eye on them. This means she’ll probably be a little more stiff in the presence of these particular cats. As far as positive ties go, she knows that Magpiesthorn seemed to be on relatively good terms with ShadowClan and—so long as it means that her Clan is not going to be at war—she’s more than willing to continue at least an amiable neighborly feel with the other cat. Honestly Duckstar longs to be closer with her own Clan than any other at all. She loves RiverClan with all her heart and it shows—if there are times where it will be better to pull out of bigger issues in order to make sure her Clan remains safe and unhurt she wouldn’t be too ashamed to do it. Though she’s a friendly cat, RiverClan will absolutely always come first, and there are few things that could properly sway Duckstar’s mind on this matter. She cares strongly about what goes on within her borders, and tends to view RiverClan as a rambunctious family. Family doesn’t always get along, but she loves them all anyway y’know? Ultimately Duckstar stands for what she thinks is right, and can be very stubborn in her opinions and mindsets. When she’s made her mind about something it’ll be difficult to sway her, but she rarely backs down from a promise made or a debt owed. The age in brackets is the number of moons the cat held the rank for. Italics means the character/stage was prior to roleplay's start and never roleplayed. » Carrionplace is on the edge of the territory, but for the sake of CTS is not seen as a part of ShadowClan territory, despite commonly filled with ShadowClan cats. » Rosestar, in the position for 6 moons. » Rosestar is known for her peaceful, compassionate nature, a mediator that would rather settle a brawl through silvertongue than claw. Yet this does not mean she rolls over and allows transgressions against the warrior code. She is fair when it comes to most punishments-- she would rather use consequences from rule breaking to teach a lesson rather than to create animosity. However, she has very little patience for loners and rogues on her territory. She does not enjoy them taking prey away from her clan, and she is right to be particularly wary ever since the attack from Leaftalon and his band of stray cats. It would be much more difficult for a rogue or loner to prove themselves worthy as members of ShadowClan than a cat from another clan that has asked to join their forbidden love. Love, after all, can create loyalty. Yet that does not mean Rosestar would not put them up to some sort of test or be a tad suspicious-- any that wish to join ShadowClan from the outside must prove their mettle and their loyalty. Most preferable to her are tests of wit, as Rosestar values the cunning as well as the strong. Currently, ShadowClan's only ally is RiverClan, out of Rosestar's respect for Magpiestar and how he has lead his clan. As for the other clans, she knows that ShadowClan is viewed fairly stereotypically-- the clan of shadows is always so easy to make the villain in stories for kits, and Rosestar seeks to rectify this image. Therefore, she has no plans to expand her territory. Granted, if the clan got so desperate to the point where cats were dying, Rosestar would absolutely take action via force. The presence of the Thunderpath makes this difficult, though, so it's practically a moot point. Even though there is a lack of allies, Rosestar does not mind making them. Threats can occur to more than one clan at a time, and in her eyes it would be foolish to die alone than band together to solve a problem. It is because of this she is civil, and stresses such at Gatherings, although she realizes she cannot control every border patrol or accidental territory crossing. Rosestar also discourages the cats of ShadowClan to hunt the rats from Carrionplace. It is very clear to her that they carry disease, and if there is other prey to be had, then those creatures should be hunted first. She does not want a repeat of her first lost life. All in all, Rosestar is a keeper of the warrior code, and hopes that the noble and proud ShadowClan can follow her lead and rise past the stereotypes that pervade the stories of kits in other clans. » SkyClan is set in the forest, before the move away from the other clans, so be sure to keep this in mind, rather than the gorge image we know well for them. They have a similar sort of camp to ThunderClan's, located in a hollow. » Don't forget that SkyClan in the forest are known for their strong hind legs and in particular their tree-climbing abilities. A lot of their battle specialities are based in the tree-tops and attacking from above. If you want a cat specialised in tree-climbing, SkyClan is the most suitable clan. » Pinestar, in the position for 6 moons. 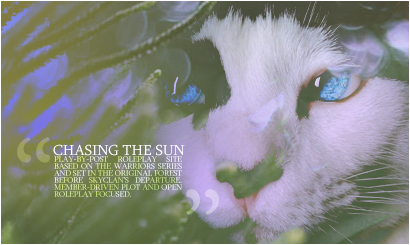 » SkyClan under Pinestar's control is a clan that functions rather strictly by the code. He does not tolerate cats who's loyalty is not completely for their clan, and any cat who's loyalty has strayed beyond serving SkyClan is likely to be exiled. He is not tolerate of cross-clan relationships, nor those who refuse to fight to protect their clan-mates, and will challenge any cat who does not protect their clan. Loyalty he holds above all else, and to a degree it also makes him distrustful of cats who approach the clan from the outside. Any cat who wishes to join the clan will be faces under severe scrutiny, and must fight for a place within the clan. Should this cat waiver in their dedication to the warrior code or SkyClan, they are exiled without a second though. He does not give second chances to those who come from outside. However, a cat coming directly from another clan will never be welcomed, as they have proved they have no loyalty in Pinestar's eyes. When it comes to his borders, Pinestar runs them with a hard grip. He knows what SkyClan own and deserve, and any cat who tries to change that will be brought to an abrupt halt. While he will not fight unnecessarily, he will also not allow for other clans to just take from SkyClan. However, as long as he is not provoked, Pinestar will never try to expand borders himself, and those caught inside the borders will always be addressed sternly, yet civilly, as as long as they leave quickly he won't risk a fight breaking out. For small breaks of the warrior code, or the twisting of unspoken rules, however, it depends on the situation how he will react. There are times where, particularly for younger cats, he will be lenient, so long as the lesson is learned. After all, he supposed some rules are meant to be broken. Currently, the only clan he considers an ally is ThunderClan, due to their joined effort to remove the badger threat to both clans. All other clans as far as he is concerned need to be treated cautiously. The age in brackets is the number of moons the cat held the rank for. » Falconstar, in the position for 2 moons. » Falconstar is a big proponent of the warrior code. ThunderClan might be the least conservative of the clans, but under Falconstar’s watchful eye, he’s been keeping the clan close together, in order to best survive the recent harsh leaf-bare. For warriors, taking care of the clan must be the number one priority; he also encourages the whole of the clan to be involved in the raising and teaching of the apprentices. Outsiders are not tolerated well. Falconstar might be willing to allow one or two loners into the clan, provided they prove themselves worthy by training like apprentices and performing above and beyond the usual call of duty. He is not forgiving of anarchy and will remove any threats to the clan, should he believe it necessary. Falconstar considers SkyClan to be an ally, having recently worked with them to rid both clans of a badger and its offspring. As ThunderClan has always been, he’s wary of ShadowClan, but has no quarrel with the other clans as a whole. He keeps patrols up-to-date and watches the borders carefully. Trespassers will be given a warning, and if they do not remove themselves, Falconstar will have instructed his patrols to remove them themselves. For the warrior code within ThunderClan, Falconstar tends to handle everything on a case-by-case basis. He is very forgiving of sins, so long as he witnesses lessons learned. When it comes to his own clan, Falconstar can be somewhat of a softie, particularly with the youngest and eldest members. Nonetheless, keeping to the rules is important to him, so keeping to the warrior code is always advised. » WindClan's camp does not have standard dens. The clan sleeps together under the stars, with the only dens being the medicine cat's den, the elder's den and the nursery. When it rains, the clan moves to tunnels just outside the main camp for shelter. » While the tunnels are a notable place on CTS, we do not implement the new WindClan ranks provided in Tallstar's Revenge. It is treated that moderate use of the tunnels is a general skill all cats are taught, with caution emphasised on using them due to dangers. » Redstar, in the position for 16 moons. » Redstar likes to get things done, and in a very timely manner, which is what she wants to see from her clanmates and warriors. As long as things get done like they should, she doesn't really bother with theatrics as long as it doesn't break the warrior code. She's a very firm believer in structure and not leaving things unfinished and definitely doesn't tolerate threats or fights between clanmates and will punish anyone who breaks that. When it comes to outsiders joining the clan, weather they are kittypet, loner, or rogue, Redstar is willing to listen to their point of view however, that doesn't mean she wont watch them like a hawk until they prove they are worthy of the title "warrior of windclan". it'll take a good amount of jobs done before she'd even remotely be able to trust them with anything; and starclan forbid they or any other cat decide to leave the clan. the moment they step out of camp stating they're leaving, she will forever treat them as a traitor and Redstar despises traitors. She's been leader for a while now, and thus, since she became leader, she demands respect because her word is law. Redstar expects her words to be followed the first time and not have to repeat herself for any reason what-so-ever. She dislikes those who talk back when she gives a direct order and after the second order she will give an ultimatum of listen or leave, which leaving results in them never allowed to return. While she's kind to the point that she has the patience for them to respond eventually, she wont hesitate to show her strength. If she finds out about a romance between one of her warriors and someone from another clan or outside of it, she will force it to a stop and put her warrior under guard; if the relationship results in kits, she will accept the kits because they are part windclan and are innocent despite their parents; however the parent will be forced back into an apprenticeship until she deems them a warrior again.